Standing on the granite, watching the river roll by, October seems like it was only yesterday. October was the first and last time we were here. Looking for a way to avoid the crowds, we wandered along a lightly used trail til it faded out as the forest did the same. The pines thinned and the ground turned to bright granite. We had emerged on the edge of an inspiring scene, where water flows over bare rock in a series of cascades. Shallow and lazy, it runs through the flats before diving over the sequential shelves to bubble and roll in the blue-green pools at their bases. We wandered downstream a bit, sat on the rocky banks, basked in the warm sun. We did not go very far, though, and the mystery downstream lodged itself in our minds. Do these cataracts go on forever? Is each turn of the river as beautiful as this one? Today, we have returned to find out. It's sunny with blue skies, just like last time. The river is flowing well, maybe just a few inches lower than it was nine months ago. The hermit thrushes are singing in the woods as we walk downstream over familiar ground. What a joy to be back in this place. In a park replete with natural landmarks and teeming summer crowds, it's beyond grand to walk through a less-traveled world beyond the reach of rubber and asphalt. Soon enough, we are in territory that's new to us. These are falls we haven't seen before, pools whose banks we haven't walked, meadows whose flowers we have yet to admire. Shooting star and lupine bloom in the grass while Brewer's and red-winged blackbirds call from the stream-side thickets. High peaks can be seen in the distance, reaching above the forest that hems us into this riverine world. The water calms and rounds a long bend, taking a relaxed approach to its gravitational obligations. We follow its lead. My thoughts turn to John Muir often in Yosemite, but this experience in particular has me wishing I'd been there with him. 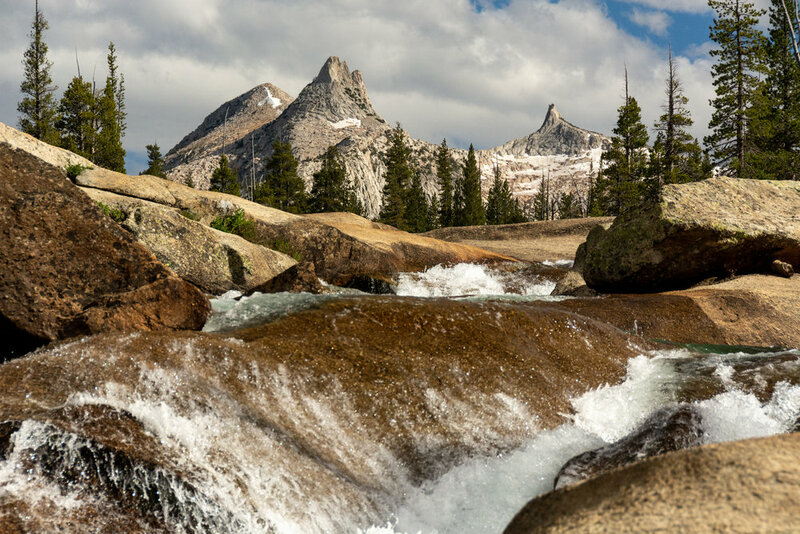 The appeal is undeniable: rambling for days on end through the high Sierras, stopping wherever seems right, lingering by a stream or tree to examine it fully, climbing a peak to see what it's like at the top. I know the land was far from "pristine" in Muir's time. Sheep and their herders were ranging across the Range of Light. Logging was well underway in the forests where the sequoias grow. The idyllic world of wilderness we often imagine was not his reality, but his reality was perhaps closer to it than the mountains we wander today. There were no trails winding through the woods, no cars in the valley, no planes overhead. But, there were also no rules for the preservation of this land, no lines on a map defining the sacred park. Now I wonder which era was better. The unprotected and untrammeled or the conserved and congested? Each have their faults. I'm inclined to favor Muir's time, for his days saw less people and more snow. That said, I am eternally thankful for this park. The river has resumed its falling as it drops through a narrower gorge. The banks are steeper, the forest closer to the water. Our path draws near to the flow, pulls away into the trees, then heads back towards the current, flowing along the path of least resistance just like the river. The water here is more energetic, more lively, more eager to lose elevation. We stand on the exposed rocks and attempt to discern the river's course downstream. Rounding a dome of granite, we arrive at the largest drop yet. The river makes a two-stage plunge of about fifty feet before collecting itself in yet another clear pool. We are not alone here, but that's alright. The roar of the falls muffles other conversations. We can sit in peace and watch the spectacle. Upstream, there is the ever-entrancing waterfall. Downstream, the river carries on just as beautifully as it has been for the last four miles. This seems like a fine spot to turn around. We'll head back upstream from here, leaving more mystery downstream for another time. There's still plenty to appreciate on the return journey, heading back upriver through these shining mountains.